The ASTROWORLD: WISH YOU WERE HERE tour has hit incredible milestones being one of the off wall live shows with raging energy from fans across the world. 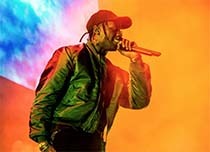 Getting its name from the currently defunct Six Flags amusement park located in Huston, Travis Scott felt torn and translated his personal sorrows into this psychedelic trap album. What’s the best part? It’s now coming to Vegas. Travis Scott just announced the second part of the tour that will make a stop to the T-mobile Arena located in Las Vegas. Getting high recognition from Billboard the Houston rapper has made the ASTROWORLD tour legendary. The Travis Scott Concert in Las Vegas will take place On February 6 and will hands-down be the apex of his whole tour. If you have never attended any Travis Scott concert, the Las Vegas ASTROWORLD will offer you an incredible experience. Constantly developing from a timid to a full-blown monster, the concert will definitely keep your adrenaline pumping all night long. Performing alongside Drake, J. Cole, Kendrick Lamar among others, the Travis Scott Concert in Las Vegas will offer you a diverse experience. In the past ASTROWORLD shows, Travis has combined innovation and creativity by bringing to the fans the virtual experience. He has built real-life amusement parks for all the live shows and we can’t wait to see what’s in store in Las Vegas! Ranging from a carousel to a Ferris wheel no one knows what to expect. The Travis Scott concert in Las Vegas will offer an incredible spectacle filled with roller coasters within rafters, incredible flames, and his signature giant inflatable astronaut. Wondering whether the Travis Scott concert in Las Vegas will be sold out is a complete understatement. The Wish You Were Here tour sold out in a period of two nights! No one knows what to expect.